Yeast infections are not only physically uncomfortable but they can also affect an individual mentally with feeling of lower self-esteem. While some might consider hiding and ignoring this condition, sweeping it under the rug is never the answer. The fact of the matter is that you will need to take action as soon as possible. This is where anti-fungal treatment products, in this particular review Yeast Clear, come into play. Yeast Clear is said by its manufacturer to treat yeast infections and prevent them from recurring. The supplement is designed to balance out alkaline and pH levels in the body which should prevent the overgrowth of candida in the long run. Yeast Clear utilizes a proprietary blend of “good” bacteria to help prevent and eliminate the spread of candida fungal infection. It contains bacillus coagulans, bacillus subtilis, enterococcus faecium, bifodobacterium longum and lactobacillus acidophilus. This combination of probiotics helps improve gastrointestinal health and also acts as an antibiotic. The product also contains natural ingredients such as Fructo-oligosaccharides (FOC) which helps improve gastrointestinal health, and undecylenic acid which has anti-fungal properties. The dosage for this supplement varies. For first time users, it is recommended to start with two capsules per day (morning and evening). After the first month you increase dosage to 3 capsules per day (morning, afternoon and before bed). It is important that you avoid foods with with sugar in them as yeast infections thrive when the body has high blood sugar levels. Yeast Clear is relatively safe to use. It uses 100% natural ingredients which should keep risks of side effects extremely low. It is also designed so that it won’t interfere with the effects of other prescription medication. However, it is best to stay on the safe side and consult with a doctor about using Yeast Clear, if you are pregnant, nursing or taking other medications. 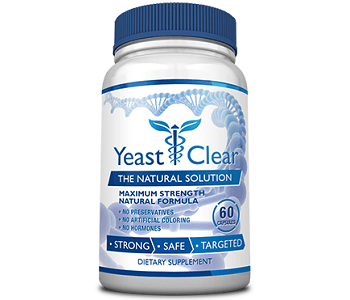 Yeast Clear contains 60 capsules per bottle which is just enough for the first month’s supply. One bottle is currently priced at $49.95. You can buy a Starter Package (2 bottles) for $70, the Advanced Package (4 bottles) at $99.80 or the Top Selling Package (6 bottles) at $139.70 ($23.33 per bottle). Yeast Clear comes with a solid 60-day money back guarantee. This is plenty of time to see if the product works for you. You can return both used and unopened bottles to the manufacturer and get a full refund, excluding shipping charges. At the time of writing Amazon customer feedback for Yeast Clear was impressive with 83% positive ratings versus only 8% negative. Overall, Yeast Clear is a worthwhile supplement when you are have a yeast infection or if you have suffered from them frequently. Not only does it help eliminate candida fungi infections, it also strengthen the immune system of the body to prevent future spread of this fungal infection. The money-back guarantee makes trying the product risk-free and the multi-bottle packages make the per-bottle cost very competitive.